United Nations Deputy Secretary-General Amina Mohammed addressed the Heads of State summit of the Shanghai Cooperation Organisation (SCO) on Sunday, stressing that the organization's impact in the political, economic and security realm, extends well beyond the large Eurasian region that its members represent. “You are playing a growing role in shaping the global agenda, based on cooperation and dialogue,” Ms. Mohammed told the group in Qingdao, China. The “Shanghai 5” was established in 1996 to cement peaceful cross-border relations between Kazakhstan, Kyrgyzstan, China, Russia and Tajikistan. It has since metamorphosed into the SCO, which now includes Uzbekistan, India and Pakistan. “The world needs a recommitment to multilateralism, and we need it now,” Ms. Mohammed stressed. “Regional and international threats to security and stability, from transnational crime to climate change to violent extremism and terrorism, cannot be resolved by any one country alone,” she added. She flagged last year’s SCO joint communique as underscoring the 2030 Agenda’s implementation and as an important step toward strengthening cooperation in mutual sectors. “Your joint commitment to support the promotion of innovative technology; to sharing experiences in the formulation and implementation of national development strategies, as well as to working together towards the creation of a favourable investment and business climate are crucial and we are here to support you in those endeavours,” Ms. Mohammed said. “To ensure a fair globalization, we must ensure nations are able to have the necessary domestic resources and capacities to steer their economies and development agendas towards our common goals as outlined by the 2030 Agenda and the Paris Agreement,” she added. The Deputy Secretary-General commended the bloc’s commitment to counter regional threats and its revitalization of the SCO-Afghanistan Contact Group as a strong contribution to support the Afghan-led peace process. “The UN continues to support stronger collaboration between developing countries by catalyzing, brokering and facilitating South-South cooperation across many spheres,” she asserted. “Let us take every opportunity, starting with the first-ever UN Conference of Heads of Counter-Terrorism Agencies later this month, to build and strengthen our partnership and cooperation at the global, regional and local level,” she said. 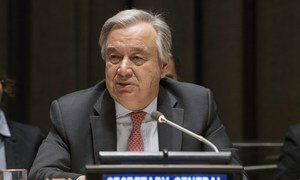 An India-United Nations fund aimed at supporting sustainable development for low-income nations marked its first anniversary on Friday, with 22 projects having already been approved in 25 partner countries.